I’m not sure if you’re aware, but the launch of Apple Maps went poorly. After a rough first impression, an apology from the CEO, several years of patching holes with data partnerships and some glimmers of light with long-awaited transit directions and improvements in business, parking and place data, Apple Maps is still not where it needs to be to be considered a world class service. Apple, it turns out, is aware of this, so It’s re-building the maps part of Maps. It’s doing this by using first-party data gathered by iPhones with a privacy-first methodology and its own fleet of cars packed with sensors and cameras. The new product will launch in San Francisco and the Bay Area with the next iOS 12 Beta and will cover Northern California by fall. Every version of iOS will get the updated maps eventually and they will be more responsive to changes in roadways and construction, more visually rich depending on the specific context they’re viewed in and feature more detailed ground cover, foliage, public pools, pedestrian pathways and more. But, Cue says, Apple has room to improve on the quality of Maps, something that most users would agree on, even with recent advancements. In addition to Cue, I spoke to Apple VP Patrice Gautier and over a dozen Apple Maps team members at its mapping headquarters in California this week about its efforts to re-build Maps, and to do it in a way that aligned with Apple’s very public stance on user privacy. If, like me, you’re wondering whether Apple thought of building its own maps from scratch before it launched Maps, the answer is yes. At the time, there was a choice to be made about whether or not it wanted to be in the business of Maps at all. Given that the future of mobile devices was becoming very clear, it knew that mapping would be at the core of nearly every aspect of its devices from photos to directions to location services provided to apps. 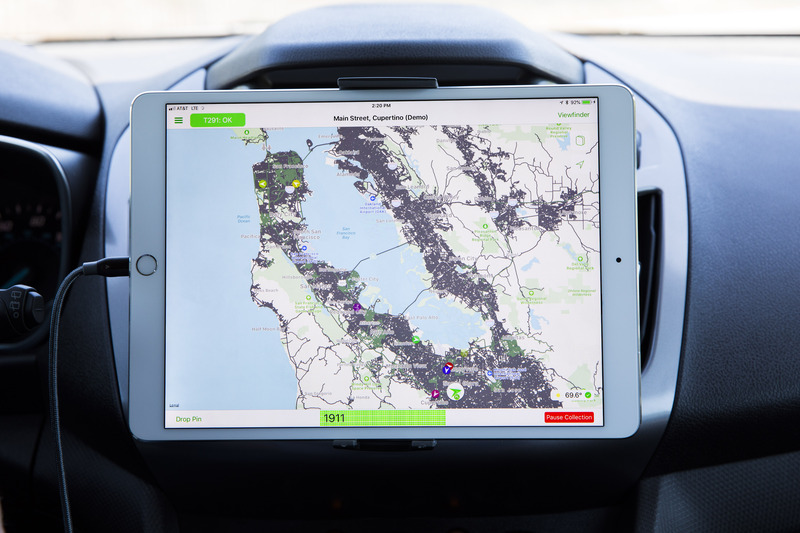 Decision made, Apple plowed ahead, building a product that relied on a patchwork of data from partners like TomTom, OpenStreetMap and other geo data brokers. The result was underwhelming. 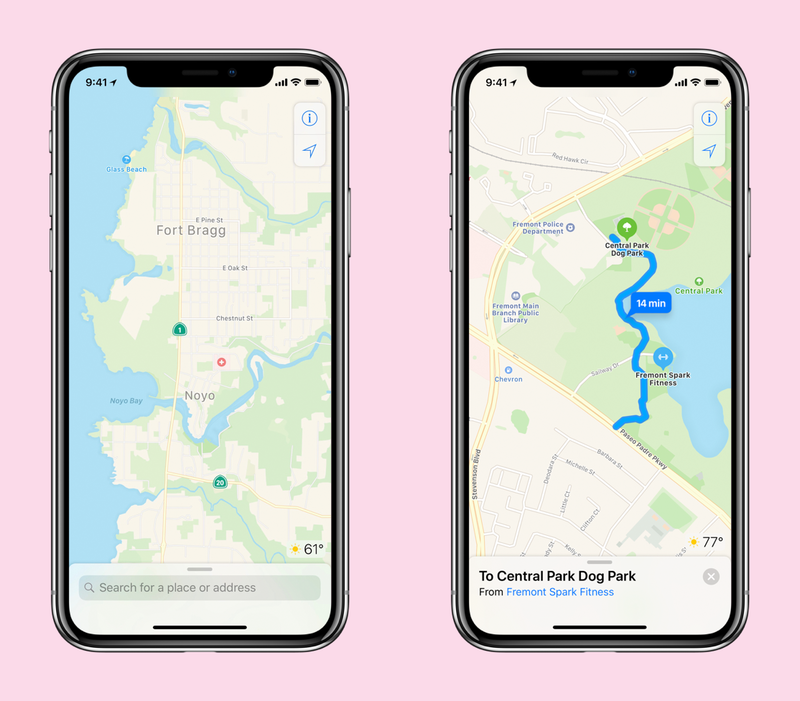 Almost immediately after Apple launched Maps, it realized that it was going to need help and it signed on a bunch of additional data providers to fill the gaps in location, base map, point-of-interest and business data. 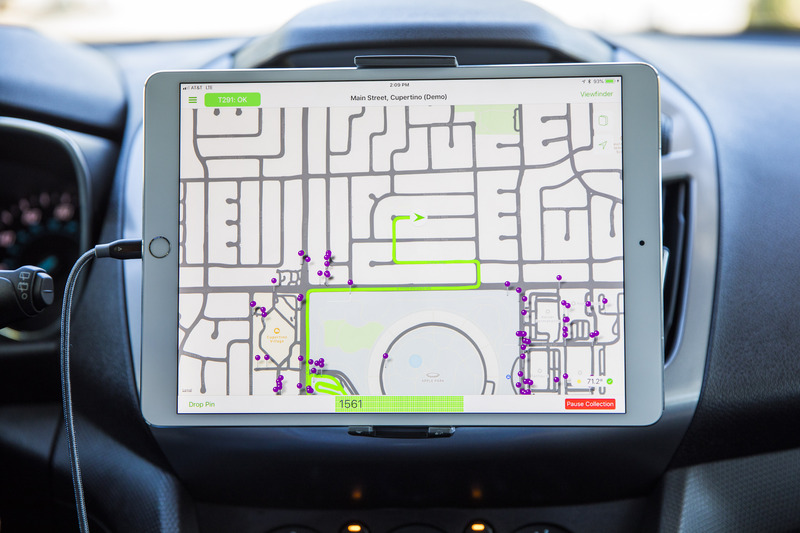 Apple will continue to work with TomTom, OpenStreetMaps and other partners, but it became clear that it wasn’t enough. “We decided to do this just over four years ago. We said, “Where do we want to take Maps? What are the things that we want to do in Maps? We realized that, given what we wanted to do and where we wanted to take it, we needed to do this ourselves,” says Cue. Because Maps are so core to so many functions, success wasn’t tied to just one function. Maps needed to be great at transit, driving and walking — but also as a utility used by apps for location services and other functions. Cue says that Apple needed to own all of the data that goes into making a map, and to control it from a quality as well as a privacy perspective. There’s also the matter of corrections, updates and changes entering a long loop of submission to validation to update when you’re dealing with external partners. The Maps team would have to be able to correct roads, pathways and other updating features in days or less, not months. Not to mention the potential competitive advantages it could gain from building and updating traffic data from hundreds of millions of iPhones, rather than relying on partner data. Cue points to the proliferation of devices running iOS, now numbering in the hundreds of millions, as a deciding factor to shift its process. I query him on the rapidity of Maps updates, and whether this new map philosophy means faster changes for users. “The truth is that Maps needs to be [updated more], and even are today,” says Cue. “We’ll be doing this even more with our new maps, [with] the ability to change the map real-time and often. We do that every day today. This is expanding us to allow us to do it across everything in the map. Today, there’s certain things that take longer to change. So a new effort was created to begin generating its own base maps, the very lowest building block of any really good mapping system. After that, Apple would begin layering on living location data, high resolution satellite imagery and brand new intensely high resolution image data gathered from its ground cars until it had what it felt was a ‘best in class’ mapping product. There is only really one big company on earth who owns an entire map stack from the ground up: Google . Apple knew it needed to be the other one. Enter the vans. 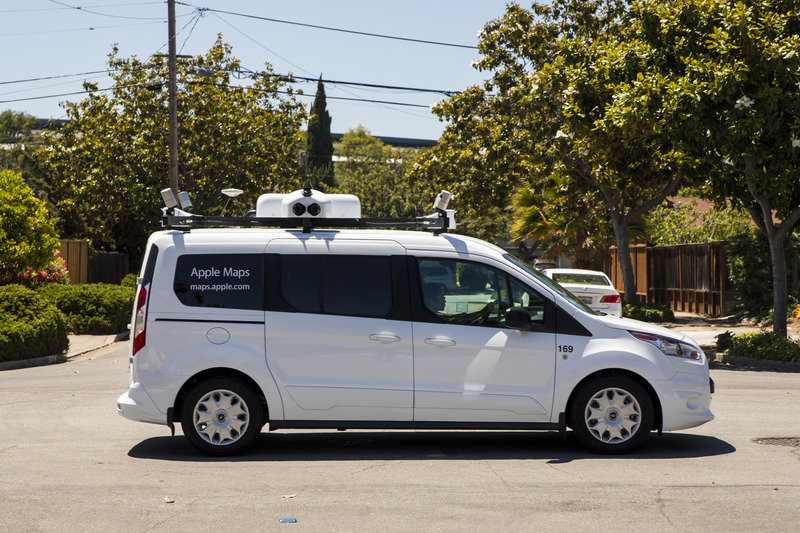 Though the overall project started earlier, the first glimpse most folks had of Apple’s renewed efforts to build the best Maps product was the vans that started appearing on the roads in 2015 with ‘Apple Maps’ signs on the side. Capped with sensors and cameras, these vans popped up in various cities and sparked rampant discussion and speculation. The new Apple Maps will be the first time the data collected by these vans is actually used to construct and inform its maps. This is their coming out party. Some people have commented that Apple’s rigs look more robust than the simple GPS + Camera arrangements on other mapping vehicles — going so far as to say they look more along the lines of something that could be used in autonomous vehicle training. Apple isn’t commenting on autonomous vehicles, but there’s a reason the arrays look more advanced: they are. Earlier this week I took a ride in one of the vans as it ran a sample route to gather the kind of data that would go into building the new maps. Here’s what’s inside. While mapping, a driver…drives, while an operator takes care of the route, ensuring that a coverage area that has been assigned is fully driven and monitoring image capture. Each drive captures thousands of images as well as a full point cloud (a 3D map of space defined by dots that represent surfaces) and GPS data. I later got to view the raw data presented in 3D and it absolutely looks like the quality of data you would need to begin training autonomous vehicles. More on why Apple needs this level of data detail later. This is just one element of Apple’s focus on the privacy of the data it is utilizing in New Maps. Throughout every conversation I have with any member of the team throughout the day, privacy is brought up, emphasized. This is obviously by design as it wants to impress upon me as a journalist that it’s taking this very seriously indeed, but it doesn’t change the fact that it’s evidently built in from the ground up and I could not find a false note in any of the technical claims or the conversations I had. Indeed, from the data security folks to the people whose job it is to actually make the maps work well, the constant refrain is that Apple does not feel that it is being held back in any way by not hoovering every piece of customer-rich data it can, storing and parsing it. The consistent message is that the team feels it can deliver a high quality navigation, location and mapping product without the directly personal data used by other platforms. The segments that he is referring to are sliced out of any given person’s navigation session. Neither the beginning or the end of any trip is ever transmitted to Apple with the middle segments. In addition, the beginning and end of the trips from significant locations like work and home are split locally on your device and sent to Apple with a separate random identifier as an added measure of privacy. Rotating identifiers, not personal information, are assigned to any data or requests sent to Apple and it augments the ‘ground truth’ data provided by its own mapping vehicles with this ‘probe data’ sent back from iPhones. Because only random segments of any person’s drive is ever sent and that data is completely anonymized, there is never a way to tell if any trip was ever a single individual. The local system signs the IDs and only it knows who that ID refers to. Apple is working very hard here to not know anything about its users. This kind of privacy can’t be added on at the end, it has to be woven in at the ground level. Because Apple’s business model does not rely on it serving, say, an ad for a Chevron on your route to you, it doesn’t need to even tie advertising identifiers to users. Any personalization or Siri requests are all handled on-board by the iOS device’s processor. So if you get a drive notification that tells you it’s time to leave for your commute, that’s learned, remembered and delivered locally, not from Apple’s servers. That’s not new, but it’s important to note given the new thing to take away here: Apple is flipping on the power of having millions of iPhones passively and actively improving their mapping data in real time. In short: traffic, real-time road conditions, road systems, new construction and changes in pedestrian walkways are about to get a lot better in Apple Maps. The secret sauce here is what Apple calls probe data. Essentially little slices of vector data that represent direction and speed transmitted back to Apple completely anonymized with no way to tie it to a specific user or even any given trip. It’s reaching in and sipping a tiny amount of data from millions of users instead, giving it a holistic, real-time picture without compromising user privacy. If you’re driving, walking or cycling, your iPhone can already tell this. Now if it knows you’re driving it can also send relevant traffic and routing data in these anonymous slivers to improve the entire service. This happens if your maps app has been active, say you check the map, look for directions, or if the app senses that you’re driving and determining location. If you’re actively using your GPS for walking or driving, then the updates are more precise and can help with walking improvements like charting new pedestrian paths through parks — building out the map’s overall quality. All of this, of course, is governed by whether you opted into location services and can be toggled off using the maps location toggle in the Privacy Settings section of the System Services menu. Apple says that this will have a near zero effect on battery life or data usage, because you’re already using the ‘maps’ features when any probe data is shared and it’s a fraction of what power is being drawn by those activities. Most probe data is shared when you are on Wi-Fi and connected to power. But maps cannot live on ground truth and mobile data alone. Apple is also gathering new high resolution satellite data to combine with its ground truth data for a solid base map. It’s then layering satellite imagery on top of that to better determine foliage, pathways, sports facilities, building shapes and pathways. After the downstream data has been cleaned up of license plates and faces, it gets run through a bunch of computer vision programming to pull out addresses, street signs and other points of interest. These are cross referenced to publicly available data like addresses held by the city and new construction of neighborhoods or roadways that comes from city planning departments. 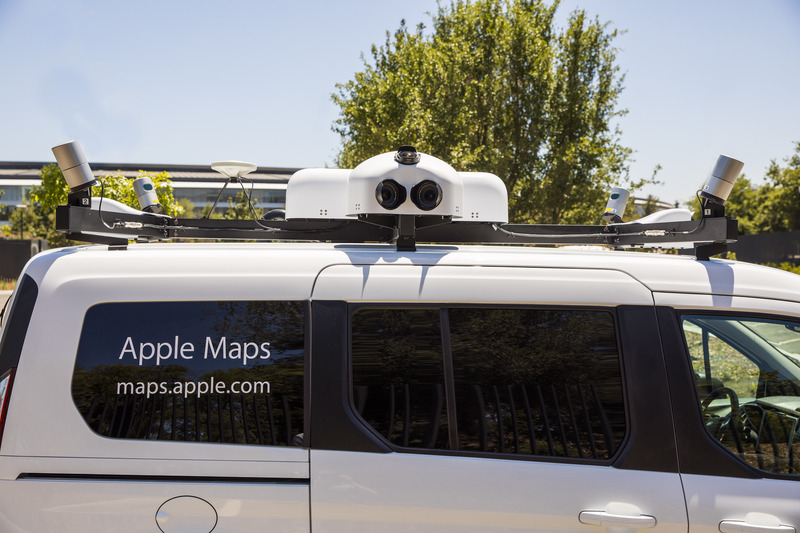 But one of the special sauce bits that Apple is adding to the mix of mapping tools is a full on point cloud that maps the world around the mapping van in 3D. This allows them all kinds of opportunities to better understand what items are street signs (retro-reflective rectangular object about 15 feet off the ground? Probably a street sign) or stop signs or speed limit signs. It seems like it could also enable positioning of navigation arrows in 3D space for AR navigation, but Apple declined to comment on ‘any future plans’ for such things. Apple also uses semantic segmentation and Deep Neural Networks in 3D to analyze the point cloud coupled with the image data captured by the car and from high-resolution satellites in sync. This allows 3D identification of objects, signs, lanes of traffic and buildings and separation into categories that can be highlighted for easy discovery. The coupling of high resolution image data from car and satellite, plus a 3D point cloud results in Apple now being able to produce full orthogonal reconstructions of city streets with textures in place. This is massively higher resolution and easier to see, visually. And it’s synchronized with the ‘panoramic’ images from the car, the satellite view and the raw data. These techniques are used in self driving applications because they provide a really holistic view of what’s going on around the car. But the ortho view can do even more for human viewers of the data by allowing them to ‘see’ through brush or tree cover that would normally obscure roads, buildings and addresses. This is hugely important when it comes to the next step in Apple’s battle for supremely accurate and useful Maps: human editors. Apple has had a team of tool builders working specifically on a toolkit that can be used by human editors to vet and parse data, street by street. The editor’s suite includes tools that allow human editors to assign specific geometries to flyover buildings (think Salesforce tower’s unique ridged dome) that allow them to be instantly recognizable. It lets editors look at real images of street signs shot by the car right next to 3D reconstructions of the scene and computer vision detection of the same signs, instantly recognizing them as accurate or not. Another tool corrects addresses, letting an editor quickly move an address to the center of a building, determine whether they’re misplaced and shift them around. It also allows for access points to be set, making Apple Maps smarter about the ‘last 50 feet’ of your journey. You’ve made it to the building, but what street is the entrance actually on? And how do you get into the driveway? With a couple of clicks, an editor can make that permanently visible. Water, public swimming pools (new to Maps entirely), sporting areas and vegetation are now more prominent and fleshed out thanks to new computer vision and satellite imagery applications. So Apple had to build editing tools for those as well. Many hundreds of editors will be using these tools, in addition to the thousands of employees Apple already has working on maps, but the tools had to be built first, now that Apple is no longer relying on third parties to vet and correct issues. And the team also had to build computer vision and machine learning tools that allow it to determine whether there are issues to be found at all. Anonymous probe data from iPhones, visualized, looks like thousands of dots, ebbing and flowing across a web of streets and walkways, like a luminescent web of color. At first, chaos. Then, patterns emerge. A street opens for business, and nearby vessels pump orange blood into the new artery. A flag is triggered and an editor looks to see if a new road needs a name assigned. A new intersection is added to the web and an editor is flagged to make sure that the left turn lanes connect correctly across the overlapping layers of directional traffic. This has the added benefit of massively improved lane guidance in the new Apple Maps. Apple is counting on this combination of human and AI flagging to allow editors to first craft base maps and then also maintain them as the ever changing biomass wreaks havoc on roadways, addresses and the occasional park. Apple’s new Maps, like many other digital maps, display vastly differently depending on scale. If you’re zoomed out, you get less detail. If you zoom in, you get more. 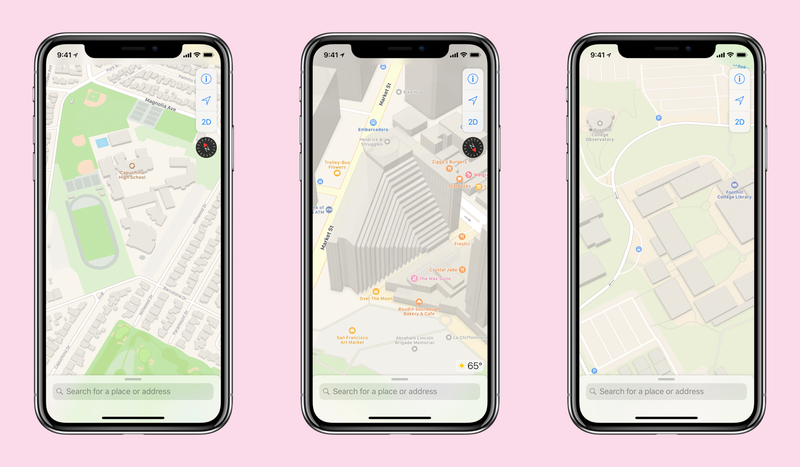 But Apple has a team of cartographers on staff that work on more cultural, regional and artistic levels to ensure that its Maps are readable, recognizable and useful. These teams have goals that are at once concrete and a bit out there — in the best traditions of Apple pursuits that intersect the technical with the artistic. The maps need to be usable, but they also need to fulfill cognitive goals on cultural levels that go beyond what any given user might know they need. For instance, in the US, it is very common to have maps that have a relatively low level of detail even at a medium zoom. In Japan, however, the maps are absolutely packed with details at the same zoom, because that increased information density is what is expected by users. This is the department of details. They’ve reconstructed replicas of hundreds of actual road signs to make sure that the shield on your navigation screen matches the one you’re seeing on the highway road sign. When it comes to public transport, Apple licensed all of the type faces that you see on your favorite subway systems, like Helvetica for NYC. And the line numbers are in the exact same order that you’re going to see them on the platform signs. It’s all about reducing the cognitive load that it takes to translate the physical world you have to navigate through into the digital world represented by Maps. The new version of Apple Maps will be in preview next week with just the Bay Area of California going live. It will be stitched seamlessly into the ‘current’ version of Maps, but the difference in quality level should be immediately visible based on what I’ve seen so far. Better road networks, more pedestrian information, sports areas like baseball diamonds and basketball courts, more land cover including grass and trees represented on the map as well as buildings, building shapes and sizes that are more accurate. A map that feels more like the real world you’re actually traveling through. Search is also being revamped to make sure that you get more relevant results (on the correct continents) than ever before. Navigation, especially pedestrian guidance, also gets a big boost. Parking areas and building details to get you the last few feet to your destination are included as well. What you won’t see, for now, is a full visual redesign. Apple Maps is getting the long awaited attention it really deserves. 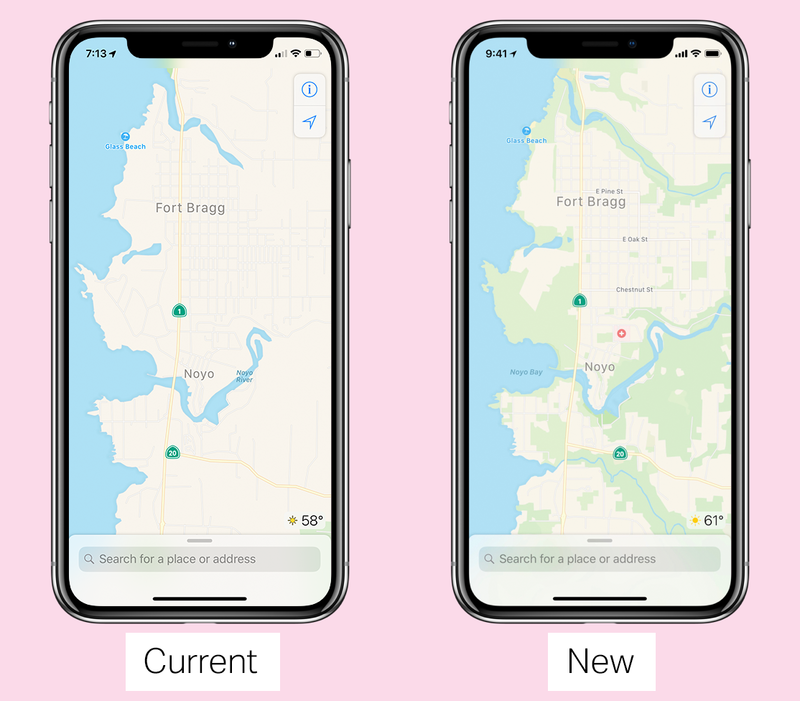 By taking ownership of the project fully, Apple is committing itself to actually creating the map that users expected of it from the beginning. It’s been a lingering shadow on iPhones, especially, where alternatives like Google Maps have offered more robust feature sets that are so easy to compare against the native app but impossible to access at the deep system level. The argument has been made ad nauseam, but it’s worth saying again that if Apple thinks that mapping is important enough to own, it should own it. And that’s what it’s trying to do now.